One of my first experiences in using tools was when I would work with my Father to design & build my car for the Pinewood Derby races in the Cub Scouts. He would let me do all of the designing myself and even let me do some of the simple cuts with a handsaw. My designs were not works of art by any means, but the cars were always fun to build, and the quality time with Dad was priceless. 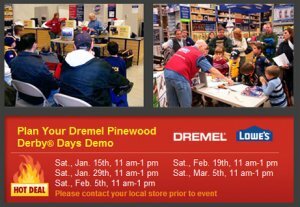 Dremel, Lowe's and the Boy Scouts of America have teamed up to help share the joy of building and the joy of family, as they hold their very own Pinewood Derby Days at every Lowe's store. Starting January 15th and running through March, Lowe's stores will be holding Pinewood Derby car building clinics to help you get started. If you are a parent with kids and 5 Saturdays to spare (you do), you should head over to Lowe's and build some cars with your kids. Head over to DremelDerby for more information.